With its golden tip glinting in the blinding sunlight, the main stupa of the Manfeilong Pagodas rises up like a shimmering lighthouse in a sea of rich tropical greenery. 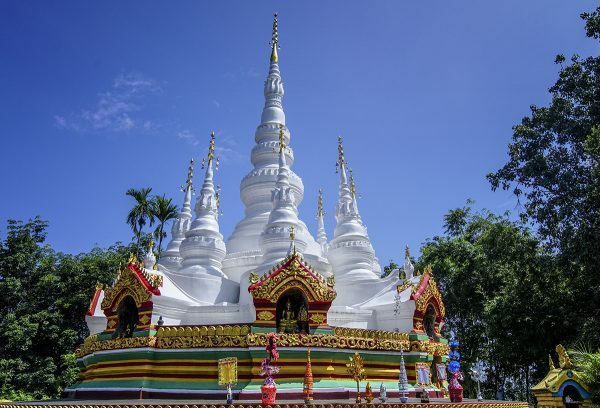 Buried in the rainforests of Xishuangbanna, on a hill near Manfeilong Village just 70 kilometres south of Jinghong City, these towering edifices are rumoured to be over 800 years old. Yet for so many years it appears they have been called by the wrong name! They are actually stupas, not pagodas, as a pagoda is a multi-tiered temple or place of worship whilst the Manfeilong Pagodas are hemispherical structures with small interiors designed for storing Buddhist relics and for private meditation. They look like large gourds and so earned the alternate name the “Bamboo Shoot Pagodas” for their striking resemblance to bamboo shoots. That being said, we don’t recommend trying to cut them up as part of a tasty stir-fry! The site is made up of one central stupa that is approximately 16 metres (52 ft.) in height, with eight smaller stupas surrounding it at about 9 metres (30 ft.) in height. Some say that the main stupa looks like a caring parent surrounded by her bulbous little children! According to Buddhist records, the complex was built in 1204 AD or the year 565 according to the Dai ethnic minority’s calendar. It was originally designed by three Indian Buddhist monks and was sponsored by the chieftain of a local tribe, but has recently been renovated. Today the stupas pure white bricks still shimmer as the sunlight hits their calabash shaped bodies and the bells that dangle from the top of the main stupa still chime sweetly in the wind. Inside each stupa you’ll find a niche featuring a statue and a relief of Buddha with another niche above it containing a relief of a flying phoenix. The gates of each stupa are topped with engravings of two giant dragons and both the interior and exterior are heavily decorated with sculptures, reliefs, and colourful paintings, all in the style of the Dai ethnic minority. All of these mystical figures combine to give the stupas an ethereal appearance. With dragons guarding the outside and phoenixes keeping watch over the inside, it’s no wonder the Manfeilong Pagodas have survived for so long! Just to the south of the stupas, you’ll find a large footprint imprinted on a rock. According to local legend, this is the footprint of Sakyamuni and is thus greatly revered by the local people. Both the Manfeilong Pagodas and the nearby Black Pagoda were built in honour of this rock. The Black Pagoda, towering over the Manfeilong Pagodas at 18 metres (59 ft.) in height, is equally famous and has an equally misleading name, as it is now silvery white in colour! It is seven-storeys high and was originally black, but has suffered numerous paint jobs that have now led to the confusion regarding its name. The Manfeilong Pagodas and the Black Pagoda are dedicated to Hinayana Buddhism, a small branch of the religion that is known for being particularly conservative, and if you visit the Black Pagoda nowadays you’ll still find monks diligently worshipping there. Every year, usually from the 13th to the 15th of April, Dai people from Manfeilong Village gather at the stupas and the pagoda to celebrate the Water Splashing Festival. This Buddhist festival represents the New Year according to the Dai calendar and involves chasing your friends and family while splashing water on them! The Dai people are known for their friendliness and will happily let visitors take part in the celebrations. After all, it’s always better to have more targets in a water fight! Sakyamuni: One of the titles of Gautama Buddha, the central figure and founder of the Buddhist faith. It is derived from the place named Sakya, which is where he was born.